was born in 1965 in the picturesque village at Poltavshchina near to thousand-years old city of Lubny. In 1991 he had excellent finished the Kharkov art school . His teachers: P.A.Shigimaga- the honoured worker of arts, Korobov G.S., Konovalov G. N. At the same year he had arrived to Kharkov in Art-industrial institute, on painting faculty. He improved his skill under the direction of well-known artists-painters B.A.Kolesnika, A.M.Konstantinopolskogo, A.V.Martyntsa, E.F.Zherdzitskogo. In 1997 he had finished picturesque branch with the red diploma. Being trained at institute the artist was the participant of many regional exhibitions. Creative activity has begun in the early 90-th together with the friend - the artist Pentjuh V. His creativity is enriched by new receptions, themes, creative finds. The painters skill gets stronger and gets new force. Gradually the artist leaves from former dryness, finds bright figurative means more richly and more colorfully to represent the validity. Improving drawing and a composition, it reaches much expressiveness, gives interesting vital generalizations. was born in 1971 in Kharkov. Since seven years she was engaged in studio of the fine arts under the direction of G.V.Semerzhinskogo. In 1991 she had finished the Kharkov state Art school. Her teachers were the Honored worker of arts P.A.Shigimaga, Bolotin P. N, Starikov V.N and other outstanding artists of Kharkov. In 1998 to year she had finished the Kharkov Art - industrial institute, restoration branch. With gratitude recollects the teachers of institute of Egorova E.P., Ganotsky V.L., Krasnov V. N, Krasnova V.N, Sokoljuk L.D. under whom influence creative character and potential was built up. In 2001 had finished postgraduate study at the Kharkov Art-industrial institute. From a student's bench Natalia has proved herself as the gifted artist and the restorer. The icon from Spaso-Preobrazhenskiy church of village of V.Sorochintsy was degree work of the artist. 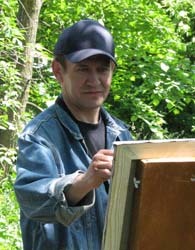 Now the artist works and lives in the Kharkov area. 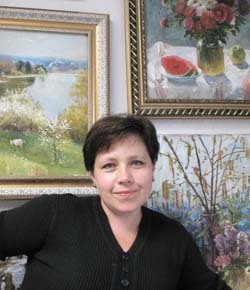 Her paintings, basically, are in private collections of Russia, Belarus, Italy, Brazil. America and Ukraine.